Most of the machines of which models are exhibited will be familiar to readers of FLIGHT, but the new 6-engined flying-boat is still a thing of the future, and a few notes about it may, therefore, ДальшеMore>>> be of interest. This flying-boat will be one of the largest ever built in Great Britain. The transparency exhibited at the Show gives a clear idea both of the construction and the internal accommodation, and there is no doubt that when completed it will be a very great advance in large flying boats. The power plant consists of six 900 h.p. Rolls-Royce type "H" engines, an installation which constitutes the largest power yet installed in any British aircraft. The engines, as will be seen from the sketch, are mounted in pairs back-to-back above the wing, a position which places them out of harm's way and should eliminate all interference from spray, particularly when taxying in bad weather. Luxurious internal accommodation will be provided for 40 passengers, and detachable bunks are arranged so that, when necessary, sleeping accommodation will be available for 20 passengers. The pilots' cabin is situated in an exceptionally high position which will provide them with an excellent view. Little as yet may be said regarding the constructional methods, but it is already announced that the hull will be built up from stainless steel, while the wing will be constructed from metal with the exception of the covering of the trailing portion, which is of fabric. The main spar will be entirely of stainless steel, as will be the nose covering, which two together will form a structure of great torsional rigidity, a feature so essential in a monoplane wing of such large proportions. 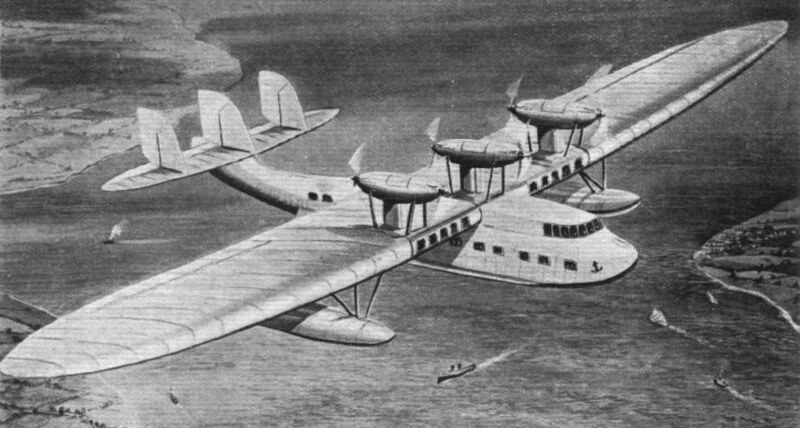 An artist's conception of the Supermarine Monoplane Flying-Boat (six Rolls-Royce "H" engines).